The capacity of a palm oil refinery mill ranges from 1 ton/day up to 400 ton/day. Batch Refinery Design: Suitable for production of 1TPD，2TPD， 3TPD， 5TPD，10TPD，15TPD, 20TPD, 30TPD. Palm oil refinery mill plays a very important role for the total palm oil production in the world. Our company, ABC Machinery, has specialized in this sector for years. Now, with experienced professionals and development team, we are capable of providing very wide range of palm oil refinery plant and palm oil production machine for international market. If you are looking for the best partner to build up a palm oil refinery mill, I am sure we can offer more than you expect! It is the most common seen process design, espacially in mini and small palm oil processing line. The production ouput ranges from 1 ton/day to 20 ton/day. The refining process generally contains Degumming, Neutralizing, Decolorization and Deodorization. The following equipment is our hot-selling mini oil refining machine set for sale. Low Cost: The price of batch type refinery is relatively low, with short cost recovering time. Can Process Various Cooking Oil: Except for red palm oil and palm kernel oil, it is also suitable for refining both vegetable oil and animal oil such as fish oil, etc. Less Land Request: With our mini refining machine set, 50m2 workshop is totally enough for starting your own palm oil refining business. Easy Operation: We will offer operation training after site installation and equipment commissioning. Your workers can master the operation very well after our short time training. It is a kind of improved process design based on batch refinign. But it is more efficient and has higher production capacity, ranging from 10 ton/day to 50 ton/day. It costs less when compared with continuous oil refinery plant. So it tis the best choice for medium-size refining factory. Steam Generator: Produce steam for de-odoring and distillation process. Thermal Oil Furnace: Supply heat energy for some devices and the temperature can be over 280°C. Refining Equipment: Includes process of de-gumming, alkali refining de-acid and water rinsing. Deodorizing Equipment: Remove the odor components off crude palm oil. Decoloring Equipment: Remove pigments, bleaching oils and grease dehydrate. Dewaxing Equipment: Remove the wax off the crude oil. Press Filter: Filter out clear oil by using of filter clay. Vacuum Pump: Supply vacuum for dehydrate, de-odor, de-color. Vacuum degree can reach up to 755mm Hg. Continuous palm oil refinery plant is normally applied for large sized oil mill with cpacity above 30 tons per day or for processing oils containing higher FFA content. The price of continuous oil refining machine is higher than the above two types, but it is designed with automatic system and can produce superior quality refined oil. The production cost is low in the long run. It has two processing technics for your option: physical refining and chemical refining. 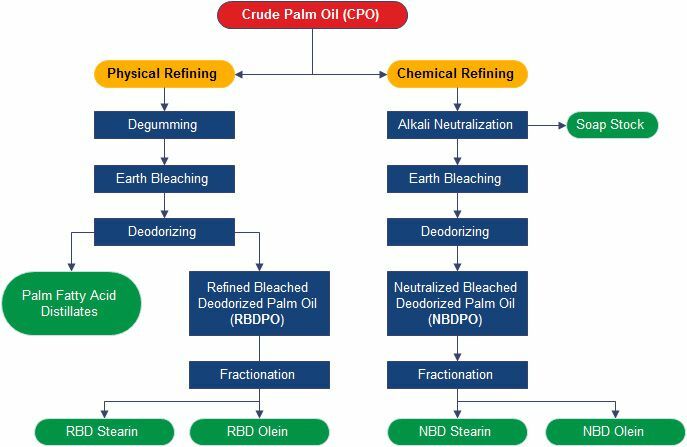 Read more about the Pros and Cons of Physical Refining and Chemical Refinging for Palm Oil Production. Oil refinery can remove the impurities in the crude palm oil, improving the oil quality such as acid value, color, smell and taste, which can greatly motivate customers to consume. Besides, the antioxidant activity is also improved after refined, and ensures longger storage time. You maybe also interested in palm oil fractionation machine. With the help of ABC Machinery, you can quickly start the palm oil business with an efficient palm oil refinery mill. We can provide a complete perfect solution no matter where you decide to start the palm oil refinery mill, such as in India, Nigeria, Indonesia and so on. Please be free to talk about your questions and confusions with below contacts, we promise one hundred percent service. Palm oil refining machine is used to process the palm fruit to produce high quality refined palm oil. Vegetable oil is the main application of palm oil worldwide. Besids, almost 50% consumables have the palm oil. Like cosmetics, hair cleaning detergent or the loaves. The palm oil market remains producing a lot of money with only Cote D Ivoire meeting the demands of its local market. Remember as the economy is growing, the demand of palm oil also is increasing to the diverse products consumed in the market. In Africa, its more advisable for upcoming business persons to look more into the palm oil business. There is enough evidence that palm oil processing and refining is a good business. The advantages makes its demand increase hence more profits predicted of $88 by the year 2022 with a percentage increase of more than 30%. Entrepreneurs are highly encouraged to dig deep into the idea of growing palm fruits in large plantations, starting a palm oil refinery mill with advanced palm oil processing machinery and selling them or their products.